New for 2014, Forcefield introduces the Women's Base Layer shirt and pants. Women now have another, much-needed base layer option available to them. 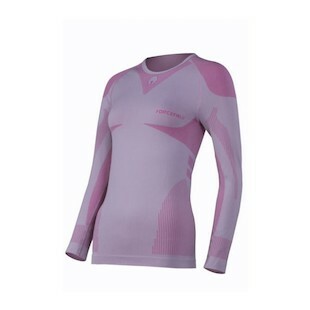 The Forcefield Women's Base Layers were designed for warm climates. The four channeled, BeCool thread, allows the garments to regulate riders comfort levels. The multi-channeled thread enables optimum moisture wicking and ventilation. Sweat is wicked away from the body, while fresh air freely passes through the garments. Then, the fresh air evaporates the exhausted moisture from the outer layer into the atmosphere. In addition to technical features, women need gear that’s going to fit their body types, and Forcefield definitely understands this. Starting from the top, the shoulders have been taken in, and the sleeves have a slender cut. The torso tapers from the shoulders to the waist then flairs slightly from the waist to the hips. The Forcefield Women's Base Layer Shirt stretches down to the hips, and the pants are high-waisted, allowing the shirt to be evenly tucked into the pants for a comfortable and secure fit. Forcefield nailed the fit and technical properties. However, their color choice is debatable. Pink! 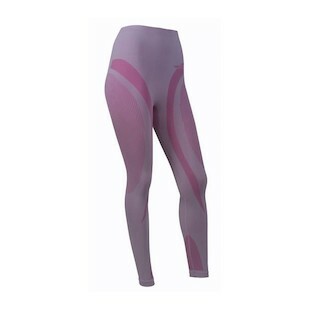 Fortunately, if pink is not your thing, these are base layers, which will be covered. The Forcefield Women's Base Layer Pants and Shirt are certainly something to get excited about. Is this the turning point? Will women finally have a sufficient amount of gear to choose from in the near future? Unfortunately, the amount of gear on the market for women is still sub-par. But, it’s getting better. Slow and steady wins the race, right? P.S. - Don’t forget to let your husbands know these are machine washable.